Now you can have some fun with the President and his wall by playing this fun Donald Trump Wall Game. President Trump is trying to build a wall but your job in this game is to break down the wall without Trump falling off the wall. 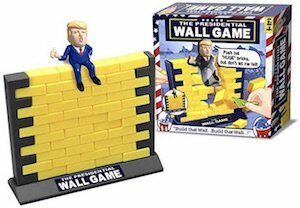 The Presidential wall game gets you a 44 brick yellow wall with on top Donald Trump and then you have to push bricks out and then see who can prevent the president from falling down. A board game like this is great for a rainy day or just when hanging out with friends that like to talk politics.